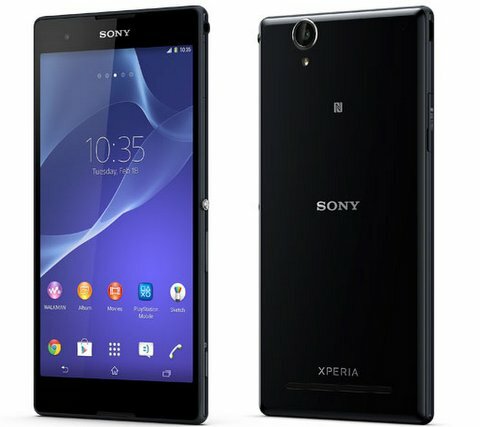 Sony has launched its latest flagship android smartphones, the Xperia T2 Ultra and Xperia T-2 Ultra dual ( dual SIM variant). The phone comes with 6 inch 720p HD TRILUMINOS display integrated with Bravia Engine 2. It packs with a 13MP rear shooter with EXMOR RS and a 1.1 MP front camera EXMOR R.
The Sony Xperia T2 Ultra / dual gains the strength from 1.4GHz quad core Snapdragon processor paired with 1GB of RAM. It has 8 GB on on board storage and further expandability via micro SD card up to 32GB. It packs with a massive 3000mAh battery with stamina mode, which should be enough from a 6 inch phablet. It is just 7.6mm thick and weighs 173 grams. It features 3G, WiFi, Bluetooth, GPS, NFC and micro USB connectivity. There will be no LTE variant for the device, at least for now. The Xperia T2 Ulta will be priced under 400 euros globally.